Even Underground Tunnels Used to Get Married in Iran! Home Homeland Custom Even Underground Tunnels Used to Get Married in Iran! One of the oldest and strangest traditions in Iran was to hold wedding ceremonies between widows and underground water tunnels called qanats. 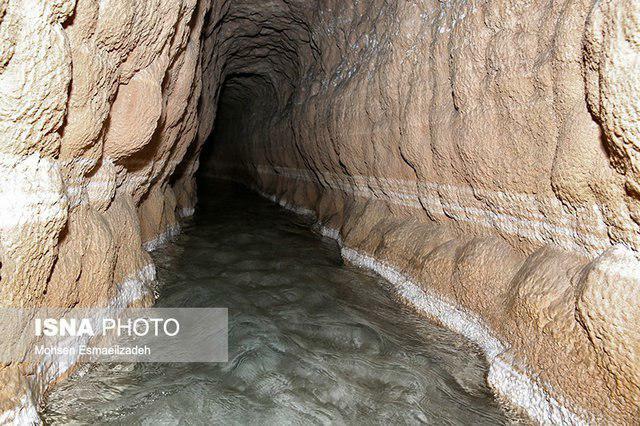 For a very long time Iranians provided the water they needed through subterranean channels called qanat. Qanats are old man-made structures that provide all or part of the required water in parts of Iran which face water shortage; hence, they are highly valuable and have a special status. Qanats are also culturally significant as they were associated with symbolic ceremonies and customs in Iran in the past. Now, the revival of those rituals can keep them from slipping into oblivion, and at the same time can serve as an effective way to attract local and foreign tourists in order to further promote the country’s tourism industry. The qanat technology was developed in ancient Iran by the Persian people sometime in the early 1st millennium BC, and spread from there slowly westward and eastward. In old times, people in some parts of Iran believed it was possible to solve the problem of inadequate water production by finding a wide for qanats based on an old tradition! Ali-Asghar Semsar-Yazdi, a senior advisor at the Iranian International Centre for Qanats and Historical Structures, has weighed in on the ancient “Qanat Wedding” rituals and customs. “The rituals, which were practiced in some parts of the country in the not-too-distant past, have now been forgotten,” he told the Iranian Students News Agency (ISNA). “In ancient communities, some people believed that if a qanat stopped producing adequate water due to drought or any other reason, the problem would be solved by holding a wedding ceremony for that qanat,” he said. “In order to hold wedding rituals for a qanat, a widow native to that village would be [symbolically] wed to the qanat in a ceremony similar to the wedding celebrations held nowadays, and the woman was regarded as the qanat’s spouse till the end of her life,” he said. Semsar-Yazdi also referred to a ritual in which the woman would take a dip in the qanat’s water after the wedding ceremony. “The qanat needed to cover the expenses of its wife. So, the owners of the qanat would meet her expenditure by paying her an allowance on behalf of the qanat; in other words, this expense was added to other expenses of the qanat such as dredging, digging and renovation [expenses],” he said. He noted the last “qanat’s wife” died around 40 years ago and there is no qanat’s wife left. He also said the city of Yazd is stranger to qanat wedding ceremonies. “As far as it has been observed, no qanat wedding rituals were held in Yazd, and no Yazdi woman was wed to a qanat as its wife; however, cities such as Isfahan and Shahrood hosted such ceremonies,” he said. In 2016, UNESCO inscribed the Persian Qanat as a World Heritage Site, listing the following eleven qanats: Qasebeh Qanat, Qanat of Baladeh, Qanat of Zarch, Hasan Abad-e Moshir Qanat, Ebrāhim Ābād Qanat in Markazi Province, Qanat of Vazvān in Esfahan Province, Mozd Ābād Qanat in Esfahan Province, Qanat of the Moon in Esfahan Province, Qanat of Gowhar-riz in Kerman Province, Jupār – Ghāsem Ābād Qanat in Kerman Province, and Akbar Ābād Qanat in Kerman Province.